On a sunny June morning bikes were loaded onto the Willow Wheeler trailer ready for the journey to Donegal. Those who were travelling, parents and 19 boys from Fifth and Sixth Forms, were full of excitement as they had heard about the success of the previous trip to Donegal. 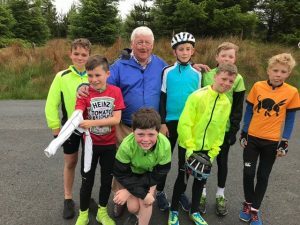 Once everything was checked we hit the road, unfortunately the weather began to turn, and by the time we reached Donegal storm Hector was brewing, yet this didn’t deter the boys braving the wind and rain for a short introductory cycle. A great way to build up an appetite for the delicious food served in the Highlands Hotel, afterwards the boys settled down in Campbell’s Hostel and were asleep before lights out (well almost all). 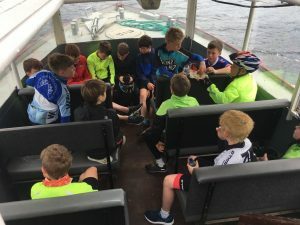 Rested after a good night’s sleep, the boys enjoyed ‘a Donegal breakfast’ which set them up for the day’s cycling. I can testify that the porridge is the best I have ever tasted. Packed lunches, provided by the hotel, were loaded into Joan’s car (mother of Cathal, Sixth Form), our ‘roadie’ for the next few days. 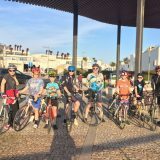 Then, water bottles and helmets were checked before Christy gave a run through of the day’s cycle, and reminded the boys to heed their group leader’s instructions. 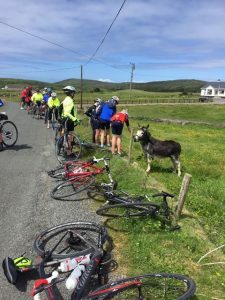 The main group was split into three smaller groups, each leaving at different intervals, and all heading for Portnoo Beach. Here the views are stunning, waves weave around small islands giving the impression that the sea is coming from three different directions. After a walk on the beach the group then headed for Tramore Beach and Caravan Park which is situated among huge sand dunes. We were delighted to see Joan arriving with the sandwiches, every morsel of food was relished, in fact, food never tasted better! After lunch we sat in the sunshine and watched the boys running up and down the sand dunes, a remarkable scene and a great memory for the boys. On the way home we stopped for ice-creams and a further stop to say hello to a donkey. 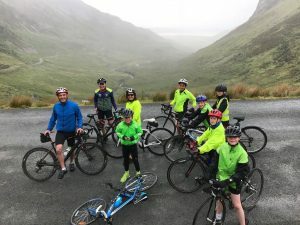 The bikes were loaded on the trailer and taken to Dungloe, from there we cycled to Dunlewey Centre, or Ionad Cois Locha, in the heartland of the Donegal Gaeltacht, a chance to practice the cúpla focal. On the way to there we had a magnificent view of Mount Errigal as the clouds began to lift. At the interpretative centre the boys were given a demonstration of traditional wool spinning and weaving followed by a visit to a weaver’s cottage. Christy had also organized a boat trip on the lake plus a session at the adventure play area. Then it was back on the bikes to head for Dungloe. Back in the hostel the boys were tired but happy. This morning we were greeted with sunshine as we headed for Killybegs. Along the way we experienced some challenging hills, though most of us had developed good cycling legs by now. 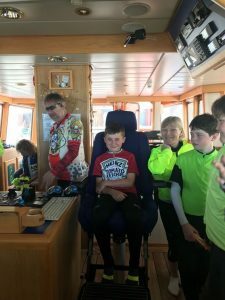 The main attraction in Killybegs was a tour of a fishing trawler owned by a former student of Blackrock College, Michael Callaghan. Herbert, our guide, gave a tour vessel and explained how mackerel are caught using huge fishing nets. The technology aboard the €15 million trawler is fascinating and the boys asked some very interesting questions. Lunch was eaten on the harbour walls before cycling back to the hostel, on our way back a farmer invited the boys to see a two week old calf, there was also another stop for ice-cream at Young’s General store. 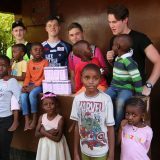 The shopkeeper was delighted with our custom and remarked that the ‘boys were a delight and so well mannered’. 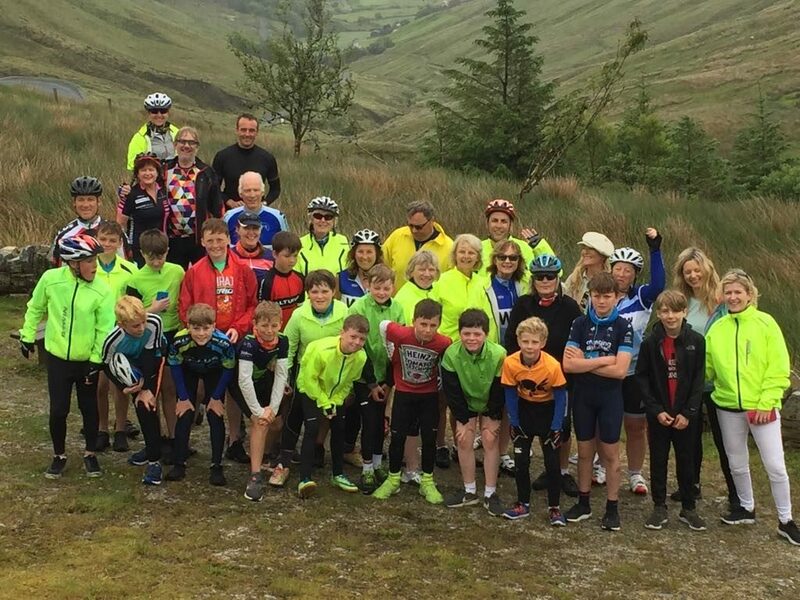 At Mass, in Glenties, we prayed for good weather to help us with the Glengesh challenge, a Category 1 rated King of the Mountain. 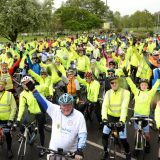 However God must have thought that we were capable of a more difficult challenge judging by the weather conditions on the day. Yet, Christy emphasised that ‘we all do our own Glengesh’. It was tough, but we all got to the top conquering the difficult ‘S’ bends. Everyone was applauded as they reached the top and the sense of achievement was palpable, something that will never be forgotten. A truly great day. That evening Christy handed out Certificate of Achievement, which we accepted with pride. Sadly, all good things come to an end, and we were very sad to be leaving Donegal. To finish the trip in style Christy treats the boys to a visit to WaterWorld in Bundoran, his hometown. 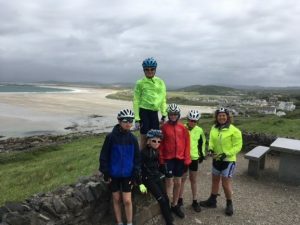 The Willow Wheeler Donegal Hostel trip is a unique experience, one which gives members great cycling opportunities, beautiful scenery, and visits to different parts of our heritage. For new members, adults and children, the trip is particularly special as they get an opportunity to experience the Wheeler family. One that encourages participation and lifelong friendships with others.